Founded in the year 2000, Luciano and Son Landscape Maintenance & Construction, Inc. is a professional landscape company located in South Chatham. Paul M. Luciano is the sole owner. Paul has a Masters Degree in Education, but has worked in landscaping for over thirty years. He is also certified in Ornamental Plant Management by the University of Massachusetts Extension Horticultural Program, and is certified through the Commonwealth for pesticide applications. 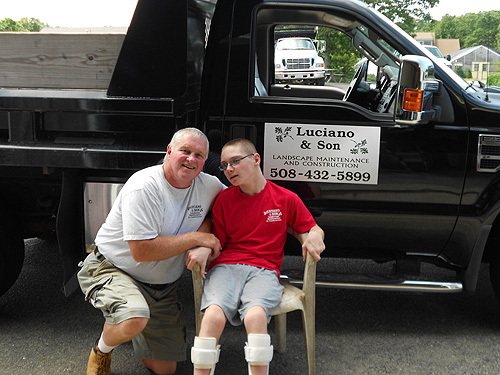 Luciano & Son Landscape employs roughly 20 seasonal workers. Crew leaders are experienced and have knowledge in all phases of landscape maintenance, and participate regularly in educational seminars. Each job is inspected and approved by Paul or a qualified crew leader. Luciano & Son Landscape carries liability insurance as well as Workers Compensation Insurance, State Unemployment insurance. The company is a member of the Cape Cod Landscape Association, where Paul served as a member of the Board of Directors, the Chatham Chamber of Commerce, the US Chamber of Commerce, and the National Federation of Independent Businesses. The company has two landscaping divisions: landscape maintenance and landscape construction, making it possible to handle both the installation and maintenance of high quality landscapes. It provides quality landscape maintenance contracts to both residential and commercial clients. Winter services include snow removal and home monitoring services. We look forward to being able to provide you with all your landscaping needs. Please consider Luciano & Son to do your next outdoor project. Call us today for your free estimate. You'll be glad you did!